Having live music at your wedding provides a wonderful touch that is becoming scarce with the availability of digital music. As a wedding musician, Jay Graham is committed to working with the bride and groom to make their day special. Having worked in many stages of planning and performance, he is available from start to finish in various capacities. 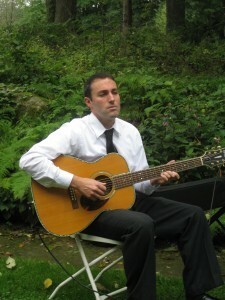 Performing solo acoustic guitar for ceremonies, selections from various singer/songwriters for cocktail hours, jazz ensembles for dinner music, and a variety of bands for receptions, he has options for entertainment in every aspect of your event!